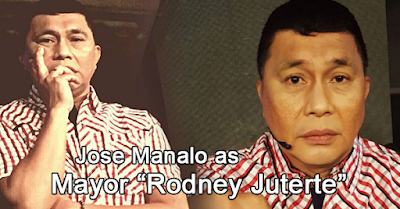 Jose Manalo Impersonates Mayor Duterte, Watch The Reaction Of The Viewers! Jose Manalo, an actor of GMA 7, comedian, makes the audience laugh out loud as he impersonated Mayor Rodrigo Duterte in the Kapuso Network variety show "Sunday Pinasaya". In this show, they featured the characters of Mayor Duterte as Rodney Juterte and Leni Robredo as Simpleni. Every word and gestures of Jose Manalo were very similar to Mayor Duterte that is why the audience was very entertained. Watch the video of the said show. It is good to know that people who are being impersonated always showed their sense of sportsmanship.